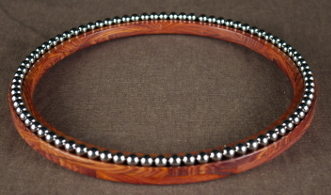 The Timber-Tronic Tone Ring is made of exotic hard wood- typically grenadillo or moradillo. 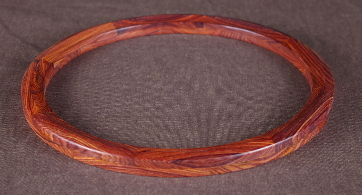 Cocobolo, as pictured, is available as an upgrade. It shaves about three pounds off the weight of a Nechville with a bronze ring and fits any Heli-Mount banjo rim. 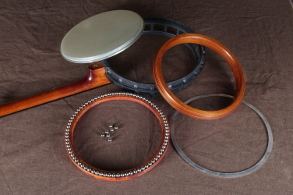 Just like our bronze rings, it works with our Cyclotronic ball bearing system. You don't lose the bluegrass sound. It's a sound all its own and can be every bit as bright and punchy. It's also available with a titanium hoop upgrade. In that case it's a circle of lightweight titanium pushing up against the head- so you still get the metal sound the banjo is known for, while saving big on weight.